I took this opportunity to hook up with my old buddy Art Jenkins. (a.k.a. the Newt) We graduated from high school together in Billings Montana. After that we both earned Electrical Engineering degrees, mine was from Montana State, while his came from Seattle University. After college I moved to Denver while he moved to San Jose. We’ve always kept in touch, and in the early 90s I used to travel to San Jose quite a bit for work. We had some crazy times back then. 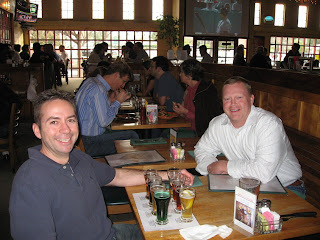 It has been about 15 years since we had been at the Tied House together – which at the time turned into one of my favorite breweries away from home. After the quick walk, I was in front of the brewery waiting for the Newt to arrive when I heard a car honk. I was sure it was Art notifying me that he saw me, but when I looked up, I saw two chickens crossing the road holding up traffic. I’m not sure what chickens were doing roaming the streets of Silicon Valley, but it did give me a flash back to Hawaii. Kinda funny. Anyway, the Newt finally showed up and we took a seat. The Tied House was not quite as big as I remember, but I could tell it was the same place. Art ordered a Cascade Amber, their flagship beer, and I ordered a sampler. They had eight beers on tap, and I got a taste of all of them. (Alpine Gold – golden ale, Cascade Amber – pale/amber ale, Ironwood Dark – brown ale, New World Wheat – American style Hefeweizen, Oatmeal Stout, Passion Fruit Pale, ESB, and a “green beer” for St. Pats day.) The two beers that stood out to me were the Passion Fruit Pale and the green beer. It had been a while since I’d had an American style fruit beer. I used to drink these all the time when I spent a summer interning for Tektronix in Portland in ’89. That was the first time I’d had fruit beer. Anymore there do not seem to be as many on most brewers’ taps, and I just don’t drink them much any more. Anyway, it was nice to sample one again - it was light and refreshing. A great warm weather beer. The other beer that stood out was the green beer. (I don’t think it had a name) It looked pretty bright, but the waitress swore it would not turn my tongue and lips green. After I got past the color, I was surprised by the flavor. It was definitely fermented with a phenolic Belgian yeast strain. I am not an expert in green beer, but having consumed a few in my college days, I remember them being died Coors Light. I always thought the intention was for them to be easily consumed in mass quantities during the St. Patrick’s Day holiday season. Those expecting died light beer had a surprise with this beer. It was a little difficult to judge given that I could not get over the color, but if blindfolded, it would pass for an excellent Belgian style ale. It makes me wonder if it was designed this way, or if the Abbey Ale was not selling well, so it turned into the next seasonal with the help of a little food coloring. 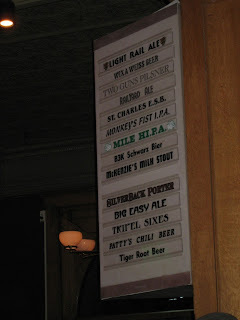 Regardless, I found the Tied House’s beer of excellent quality, balanced in world of extreme beers, and very enjoyable. Their flagship beer, Cascade Amber, described as a pale/amber ale, was well hopped, but overall had a better malt and hop balance than most pale ales being brewed today. It had a rich maltiness with a touch of roasted malt or possibly dark Munich malt. Hopheads may not travel across the country for this one, but most others will find it delicious and will be able to drink two or three in a row without getting burned out on citrusy hops. One final note. The Tied House also had an excellent kitchen. They offer pub fare, sausages, Cajun, south of the border, California cuisine and more. I had the Char Crusted Hanger Steak after the Newt and I split a plate of onion rings as our appetizer. The roasted garlic marinated steak really hit the spot after finishing the eight well-sized samplers. Just like the old days, the Tide House is a great place to go for great beer, food and atmosphere. And it was good to get back there with my old buddy the Newt! “Never before have the stakes been so high.” Those were the words Marty Jones, the MC and competition organizer, used to introduce me at the Beerdinker of the Year finals on February 21st. The winner gets, among other things, free beer for life at the Wynkoop Brewery in Denver, Colorado. Three Coloradans had previously made the finals, but none had ever won. And none of them were Wynkoop regulars like I am. All previous 12 winners were from coastal states, so that prize is not something they can enjoy weekly! The fact is, I’ve always wanted to be the BDOTY, but not for the free beer. I think it is a huge honor, so I wanted the title as a matter of pride. That is what drove me to enter the competition in 1997, 2005 and this year. And I couldn’t be more excited that I won. With all of that said, the free beer is a nice perk that I will gladly make use of. 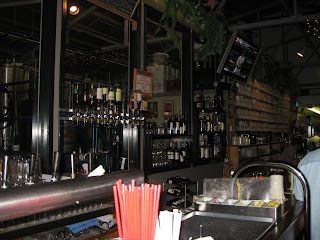 This blog entry is about Wynkoop, where I just finished enjoying a couple free beers. For most craft beer lovers, the Wynkoop is on the map. Partly because it is a great brewery, many beer authors have written about it, it has a great history, and partly because they sponsor the annual BDOTY competition that receives national press. When beer lovers descend on Denver every fall for the Great American Beer Festival, out-of-towners usually make at least one stop at the Wynkoop. Current Denver mayor John Hickenlooper (as well as Mark Schiffler, the late Russell Schehrer, Barbara McFarland, and Martha Williams) opened the Wynkoop in 1988. To do so he (and others) had to lobby the State legislature to change the law to allow for microbreweries and brewpubs in Colorado. That effort was successful. So when the Wynkoop opened in 1988, at that time located in the middle of nowhere, it was the first craft brewery in Colorado. Now the state boasts about 100 breweries, more than any other except California. And the Lower Downtown (LoDo) district of Denver, where the Wynkoop is located, is now in the heart of the city’s business, entertainment, restaurant, brewery and sports areas – in strong part due to the tremendous vision of Hickenlooper and the other founders. The Wynkoop’s ongoing success is based on great beer, perfect location, a wonderful atmosphere, and a knowledgeable and friendly staff. It is a place where I have always felt at home. So now it seems like a good time to talk about their beer. The heart of the Wynkoop’s beer selection has always been British, cask-conditioned ales. It is probably the first thing one notices when walking in the door – six Angram handpump beer engines. The ESB and IPA are always on cask, and a third, and sometimes forth, cask beer rotates. 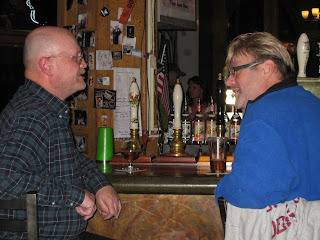 Last Friday the Sagebrush Stout was on cask. (not enough room on the sign to make the list – see my photo) But they also offer a variety of other styles. Note the two lagers on tap (the Pilsner and Schwarzbier), the German style Weissbier, a Belgian style Tripel, and a truly American offering – Patty’s Chili Beer. The Wynkoop exemplifies all that is great about craft brewing in America. Take the best beers from Germany, England, Belgium, etc., sometimes add a local touch, and add in some new American creations. And not just a great selection, but also a huge selection. Fourteen beers are currently on tap – all brewed on premises. My first beer of the night is always the ESB. It is cask-conditioned, easy drinking, and full of flavor. Very similar to the English originals. After that I simply work my way down the list, or order whatever suits my mood. (I live for variety, so I seldom drink the same beer twice in a row.) My favori te beer at the Wynkoop is the Churchyard. Also cask-conditioned, the Churchyard is a dark, malty, rich, sweetish, strong Scotch ale. But it is a rotator, so it is not always on tap. If it is on tap for your next visit, I highly recommend it. In my opinion, most of the Wynkoop’s beers are flavorful, but in balance. Especially the regulars. This is one thing I’ve always appreciated. I can bring anyone there, and they will find a great beer that they enjoy. With that said, Andy Brown, the head brewmaster, is not afraid to experiment and get bold. His latest toy is a self-designed and built hopback that he has put it to good use on the new Mile HI.P.A. If you love hops, book a ticket to Denver today. This is an extremely hoppy beer with a very American hop profile. When visiting the Wynkoop, if you ever have any questions about any of their offerings, don’t be afraid to ask the knowledgeable staff. They are well educated on the beers they serve. And they won’t hesitate to pour you a sample if you want to decide for yourself. Next time you’re in Denver, I highly recommend a visit to the Wynkoop. Whether it is for the GABF, a Rockies game, or to ride the Ski Train. And if you live in the area, go visit the brewery on 18th and Wynkoop street. It has been my home brewery/pub since June of 1991. Next week I’m off to Mountain View, CA for a short business trip, and I hope to have something to report from that excursion. I’ll try to keep it shorter next time.